Ray's life changed dramatically when he found some of his mothers journals and learned that he was adopted. This was compounded when he later discovered that he had been born in Tupelo, Mississippi and shared the same hospital and the same birthday with … Elvis Presley. Now, wait a minute! Those facts, plus the way Ray looked, (which even he had to grudgingly admit, was a dead ringer for Elvis) were just too many coincidences. What was he supposed to do now? What should he do with this information? Would anybody believe him? How would Elvis feel? Ray found out. Word got out which led to the two men meeting face to face. That changed everything. As upset as Elvis was, thinking someone was trying to capitalize on his dead brother, neither could deny what they saw. Their eyes were mirrors. An uneasy relationship ensued while they tried to figure out what to do about this. Eventually, Ray and Elvis rode motorcycles together, they argued, played racquetball, sang, dealt with a blackmail, shared stories about their very different lives and started growing closer. Ray was even mistaken for Elvis and kidnapped for ransom. Elvis got quite a kick out of that one. Ray also saw Elvis getting sicker by the day. 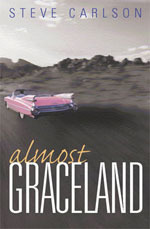 ALMOST GRACELAND tells the story of these two men, up to Elvis' death and it's aftermath. We are also privy to the poignant legacy left by Elvis, one that would change Ray's life forever.